Choice of meat sautéed with wide rice noodles, chili, garlic, basil leaves, onions, string beans and tomatoes. Choice of meat stir-fried w/steamed white rice in Thai sauce, garlic, spring onions and tomatoes. 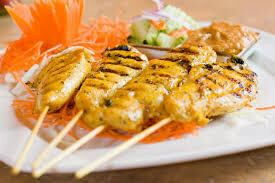 Skewers of chicken marinated in Thai spices, grilled & served with peanut sauce, cucumber relish and toast. Stir fried rice with pineapple, tomatoes, cashew nuts, egg, onion and scallions. A mixture of crabmeat, shrimp, chicken, pork and dried shiitake mushroom served with sweet soy sauce. 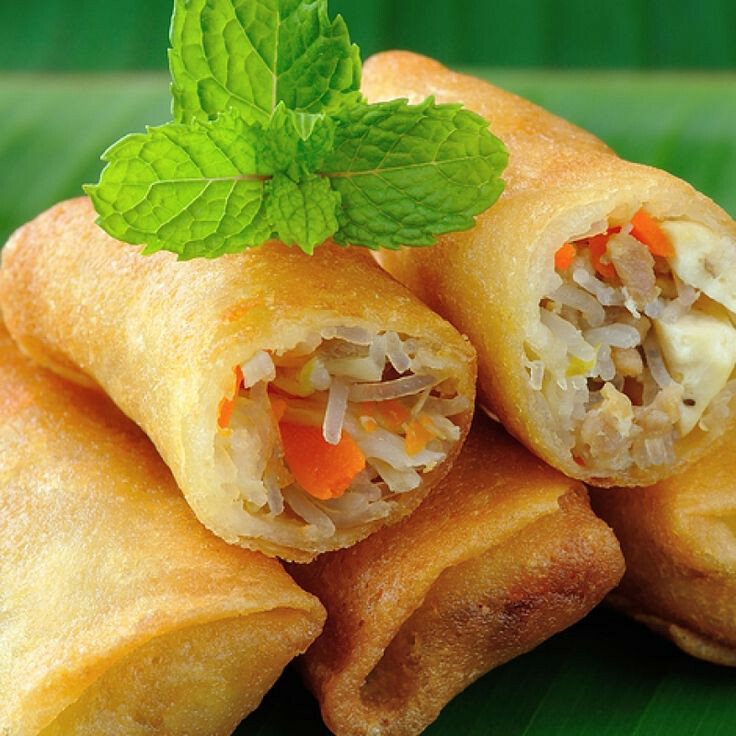 Soft rice paper and mixed fresh vegetables served with peanut sweet sauce. 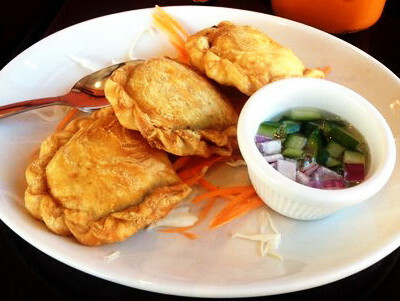 Japanese pan fried dumpling stuffed with pork and vegetables. Deep fried curried fish cake served with peanut and cucumber relish. Spicy. Shrimp and chicken wrapped with wonton skin and deep fried served with sweet sauce. Stuffed dice potato, minced chicken, onions and Thai curry powder served with cucumber relish. Choice of vegetarian, chicken or shrimp with mushrooms in Thai spicy lemongrass broth. Choice of vegetarian, chicken or shrimp with mushrooms in lemongrass, galangal broth with coconut milk. Shrimp and squid with red onion, scallion and cilantro in chili lime dressing. Spicy. Grilled flank steak tossed with ground roasted rice, red onion, scallions and cilantro in chili lime dressing. Spicy. Minced chicken tossed with ground roasted rice, red onion, scallions and cilantro in chili lime dressing. Spicy. 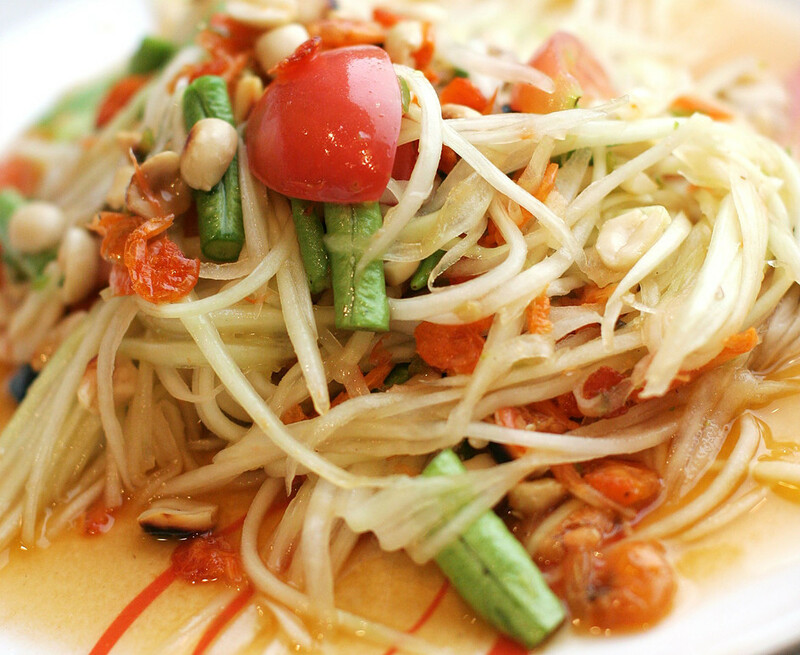 Shredded green papaya & sun-dried shrimp mixed with tomato, string beans & crushed peanut in spicy lime dressing. Lettuce, cucumber, tomato, onion, green pepper, carrot & crispy wonton with peanut dressing. 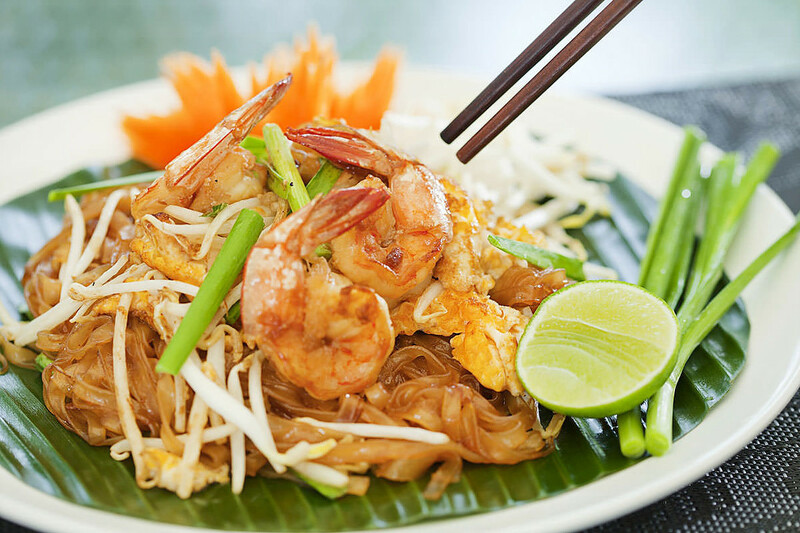 Cellophane noodles, shrimp, peanut, tomato, red onion, onion and green onion in chili dressing. Spicy. 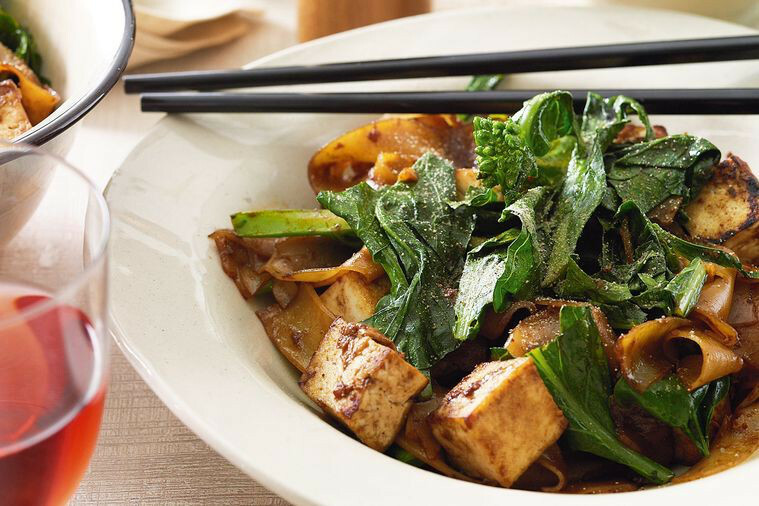 Choice of meat simmered in savory curried peanut sauce, combined w/coconut milk & sprinkled with kaffir lime leaves. Choice of meat in Thai green curry paste, eggplant in coconut milk & basil leaves. Choice of meat in Thai red curry paste, eggplant in coconut milk & basil leaves. Choice of meat sautéed w/hot chili, garlic, fresh basil leaves, red & green bell peppers & onions. Basil leaves, lime leaves, rhizone, green bean, baby corn, young green pepper and eggplant. Spicy. Choice of meat stir-fried with cashew nuts, onion, scallions & bell peppers in house special sauce. Stir fired mixed vegetables in light garlic sauce. Battered Tilapia fillet, fried to perfection; choice of sauce. Choice of meat stir-fried with garlic, fresh chili, string beans, onions, mushrooms & red & green bell peppers. Pineapple, baby corn, tomatoes, onions and scallions in sweet and sour sauce. 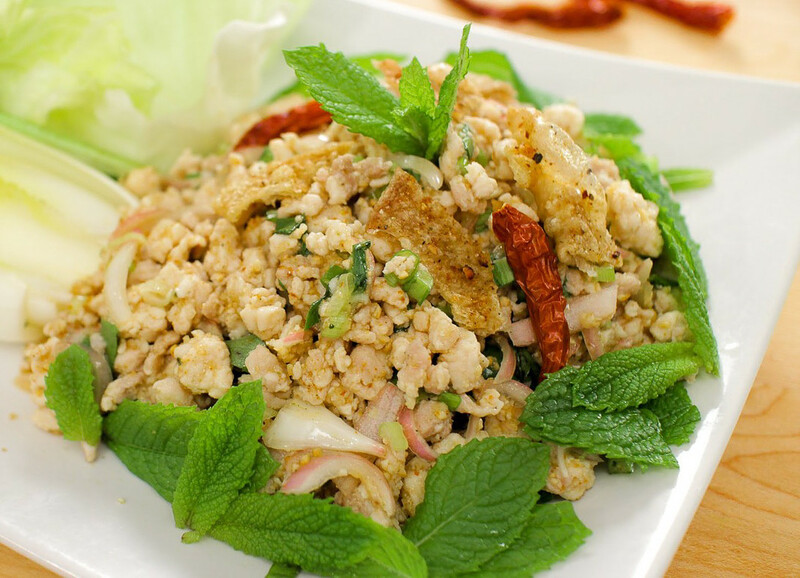 Choice of meat stir-fried with thin noodles, egg, dried bean curd, onions, bean sprouts, scallions & crushed peanuts. Choice of meat stir-fried with fresh wide rice noodles & broccoli in Thai soybean sauce. 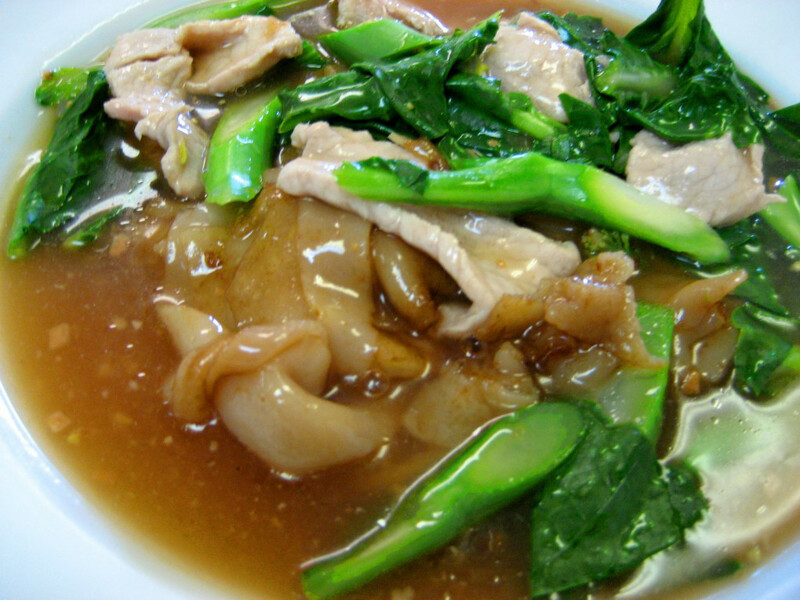 Choice of meat sautéed with broccoli in brown gravy sauce over pan-fried, wide rice noodles. Stir-fried wide noodles, egg, celery, tomatos, onions, scallions, yellow curry powder, garlic and chili. Lo mein egg noodles, napa, carrot, green bean and scallions. Wide rice noodle with chicken, eggs, green onions and carrots in a light brown sauce. Stir-fried rice with Chinese broccoli, egg and Thai sweet soy sauce. Stir fried rice with basil, onion and string bean with chili and garlic. Spicy. Stir fried rice with mild chili paste, green bean, onion and scallion. Spicy. Northern style Thai noodles served with egg noodles, fresh bean sprouts, red onions, fried garlic, turmeric, picked cabbage, coconut milk and topped with crispy noodles. Spicy. Stir-fried egg noodles with shrimp, calamari, basil leaves, lime leaves, rhizome, green bean, baby corn, young green peppers and eggplant. Shrimp, calamari and fillet tilapia sauteed with lime leaves, rhizome, green beans, bamboo shoots, garlic, chili and basil leaves. Cellophane noodles, bean sprouts, scallions, egg and crushed peanuts. Deep-Fried filet Tilapia until crispy golden brown topped with our delicious basil sauce or black bean ginger sauce or sweet and sour sauce. Thin rice noodle with bean sprouts, cilantro, spring onions, crispy wonton and peanut in a spicy hot and sour soup with your choice of meat. 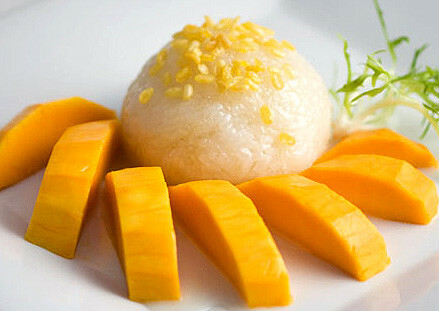 Original homemade Thai custard made from coconut milk and taro root.